My daughter's best friend M had a baby this month. M is like another daughter to me as the girls came to our house from school nearly every day and ate their lunch. I decided to make a baby quilt as a gift. There is no rush as I don't see M and her husband unless Katie is in town. Which is too bad, as I would love to get my hands on that baby! It is partly for this reason I decided not to make the quilt look too baby, and rather do it in fabrics that Baby Z can grow with. As M loves cats, that became the theme for the quilt. I have a bunch of fun, bright, quirky cat fabrics from a quilt I made for myself, so I used those as a starting point for the quilt. 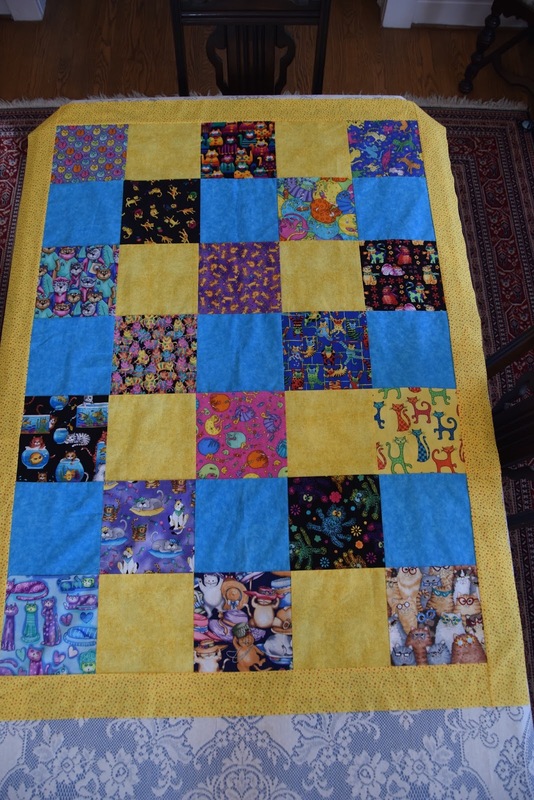 I added the yellow and blue squares in between as the cat prints are pretty busy. I found this pretty yellow print fabric to use for the border, and the top of the quilt is now complete. My next decision is what to do with the back of the quilt. I can make it one, solid color or mix it up with a couple different fabrics. I saw an idea online to add the baby's name on the back. I liked that, so I made her name out of a cute paw print and mouse fabric, and will appliqué the letters on the back of the quilt once I have the new fabric/fabrics selected. I have never made anything like that before. It was fun to learn something new, and not as difficult as I had imagined. When the back is complete I will layer batting between the top and the bottom before quilting it all together. Another decision needs to be made at that point. Sew it on the machine? Tie the layers together with thread or yarn? Then I will need to make one more fabric purchase for the binding, which completes the quilt. I'll need to see all the fabric colors together in order to select one that will blend with the others. Fun times! My community, like many others, has a Facebook page. 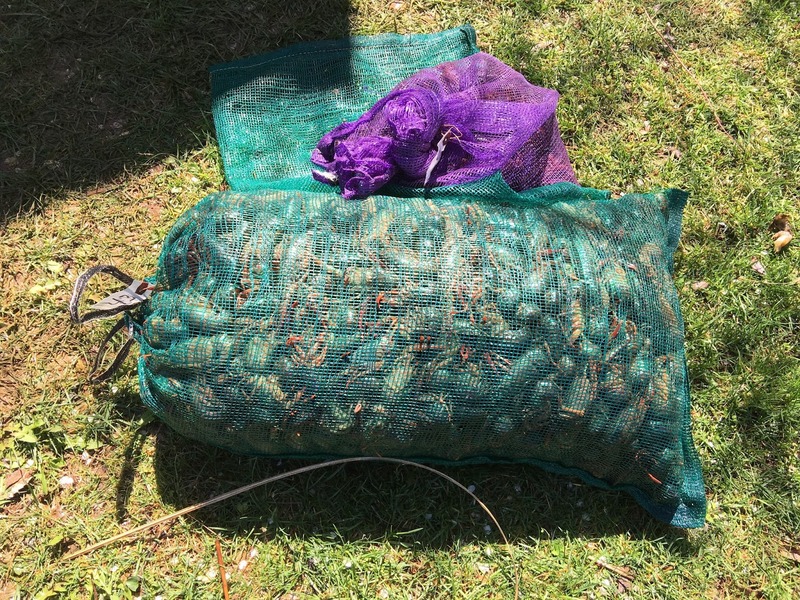 It is wonderful for keeping me up to date on who is angry about dogs pooping on their lawn, which kid ran a stop sign, lost dogs, finding out who has a sewer backup, and all kinds of other fascinating information. I don't know how I survived here all those years before Facebook came along! All kidding aside, while the listed items have indeed appeared on the page, it is truly a great resource if you are looking for a handy man or woman of any kind, and for keeping up on neighborhood events. It was on this page that I learned about the baby owls in Blackburn Park. 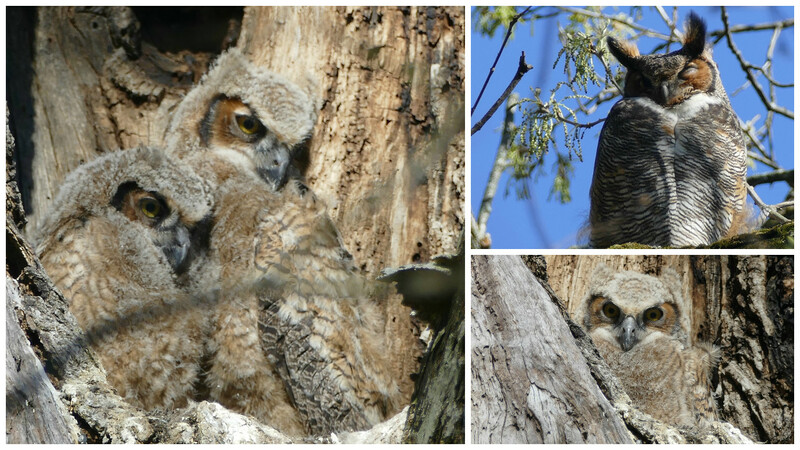 Several people had been posting photos of the momma Great Horned Owl and her owlets. The pictures were adorable, so of course I had to go see for myself. 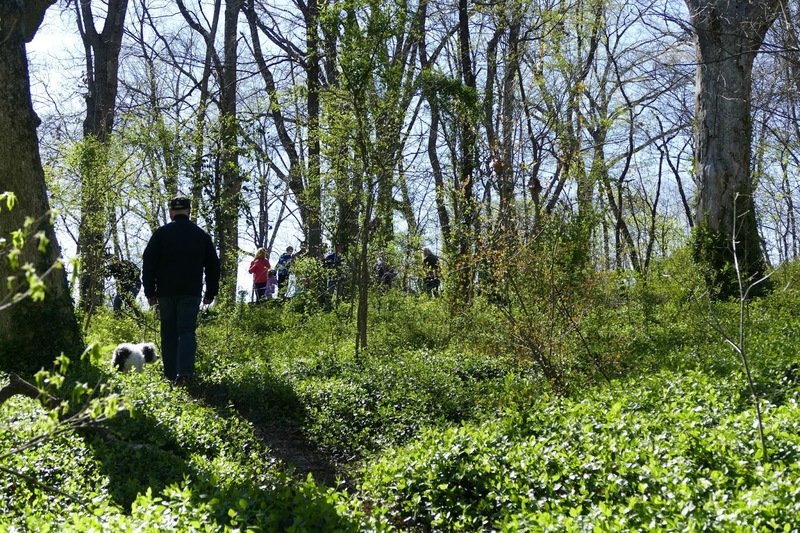 Last Saturday we took Kirby for a walk at the park, which also contains a wild bird sanctuary with trails so that you can enjoy the area. As it was a pretty if windy day, the park was teeming with activity. I was not surprised to see a half a dozen people stopped on the trail in the bird sanctuary to admire the babies. There are three of them hiding in the hollowed out segment of a tree. One was pretty bashful, so we only got a peek at it, but the other two seemed just as curious about us. They were particularly interested in Kirby. The one made some clicking noises, which I interpreted as his or her call to momma that dinner was within view. It was nice to see so many people taking an interest in the little family. After I posted my photos on Facebook, several of my friends also put up pictures that they had taken the same day. Word of the owlets has spread throughout the area. It is so refreshing to read about positive news instead of what we are normally subjected to these days. 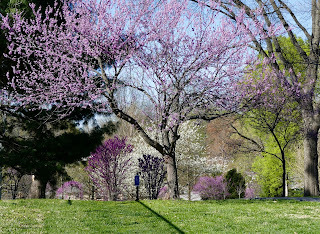 And how wonderful to live in a place where nature is close enough to enjoy on a sunny spring day. 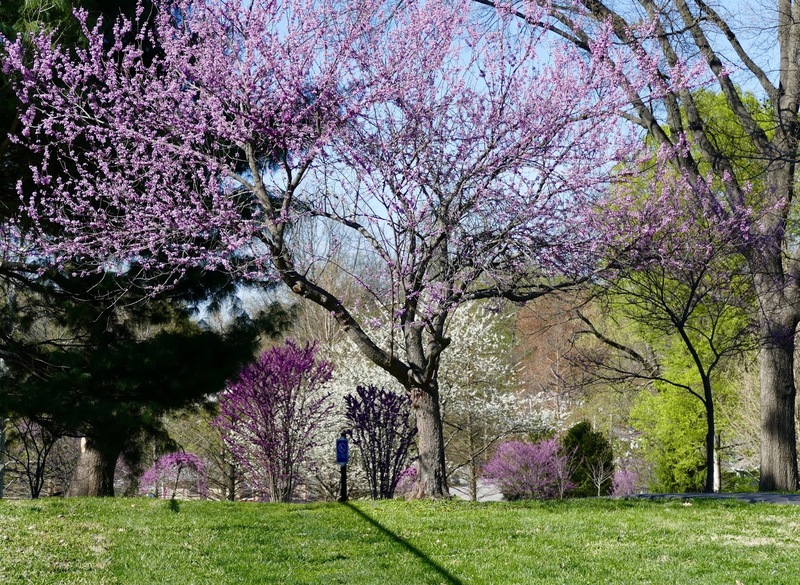 Sometimes you just need to take a walk in the park. Two of the employees at my husband's firm are from Louisiana, and one of them decided at the urging of co-workers and friends to have a crawfish boil at his house last weekend. Everyone chipped in, and the fresh crawfish and shrimp were flown from Louisiana into St. Louis last Saturday morning. I have only had crawfish once, and that was down in New Orleans many years ago. Much to my surprise, I really enjoyed my meal. 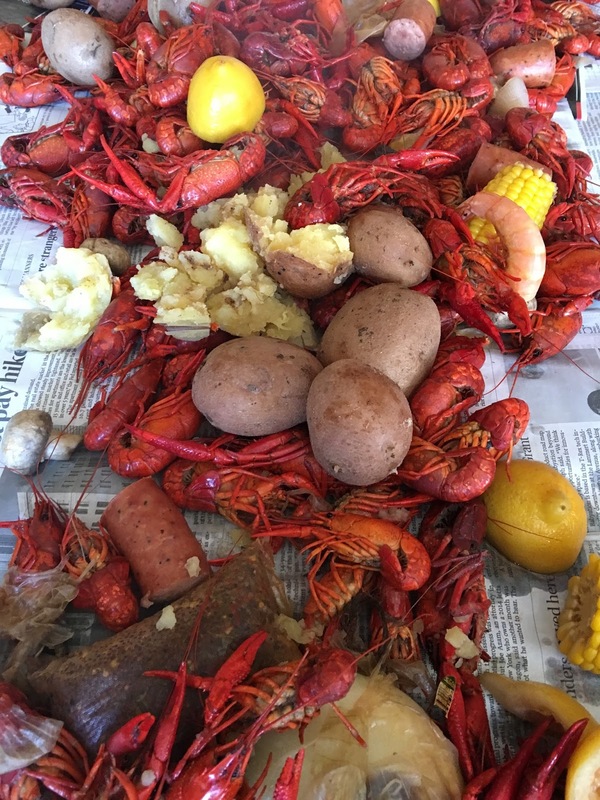 As I recall, a big pot of the crawfish was placed in front of you, and you ate to your heart's content. shrimp were added. 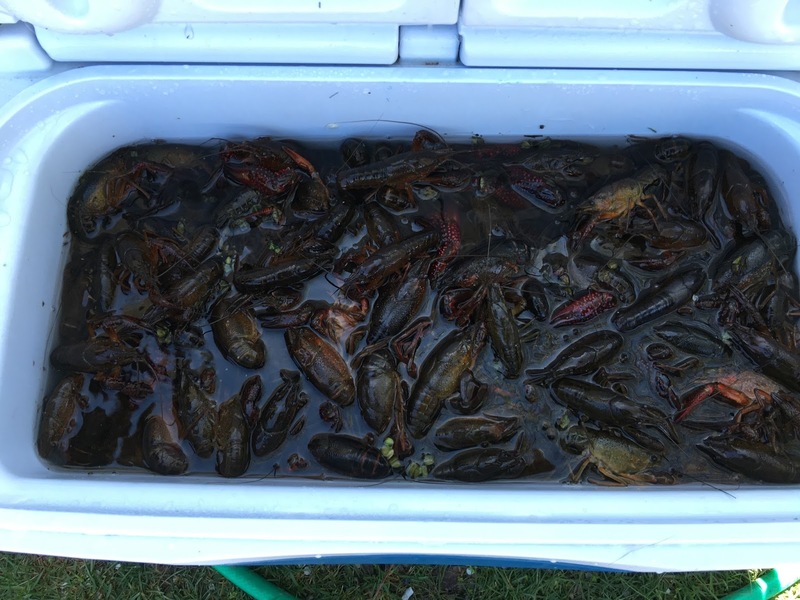 I'm not gonna lie, it was sad to see the crawfish moving around in the ice chest, not knowing what their fate was shortly going to be. Newspapers were laid out on the tables, and when the fish were ready the whole pot of goodies was dumped out onto the papers. There were no plates and no utensils - everyone just dug right in. It was quite something! The flavors were wonderful, but personally I preferred the shrimp over the crawfish. 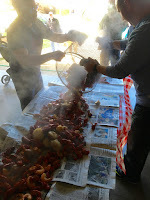 They were easier to peel, had little waste (unlike the crawfish), and had a better texture and flavor in my opinion. It was fun to see the entire process and experience a different food culture than one we normally see in St. Louis. Good times!